Hello, my account named 'HaHa' has been disabled, can you re-active it please! I was driving along the roads of Wet County in a Burrieto, to head to Blueberry to fetch myself a truck, Out comes the hacker, speeding into me, making me go flying into the sky. Then I get banned. Myself and HaHa were doing a Convoy in a Roadtrain, We was about to take a left onto the Ferry bay terminal, until a hacker rammed into us, he must of went over 200MPH (500+KPH) and make us flying We didn't know what do to, so we let him. And got Banned. Basically, me and my mate Liam221sa was doing a convoy. We left the starter bay in Vice City Island, Wet County, in a Artic trailer with a Roadtrain. A hacker came to us by the turning where you get onto a short bridge, left at the turning at end of the Vice City ISland Truck spawn. 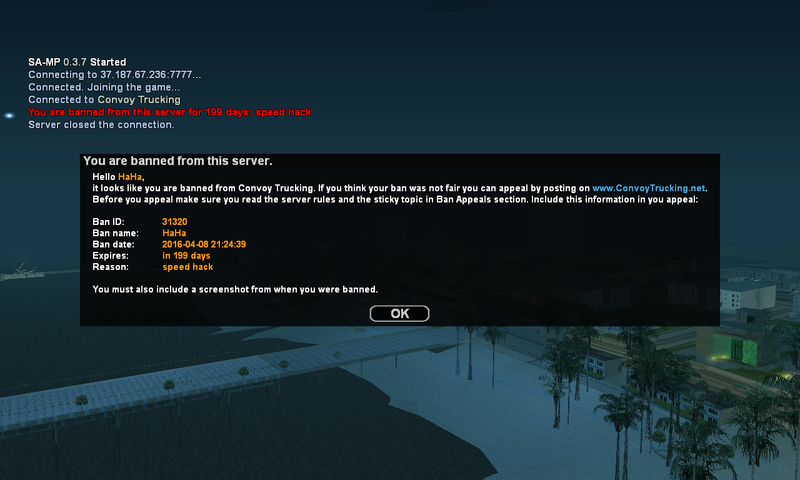 and made myself and Liam221sa banned for 'speed hacks'.